Rich in antioxidants and has low calorie soup. High nutritional value and gives Relief from cold and cough. 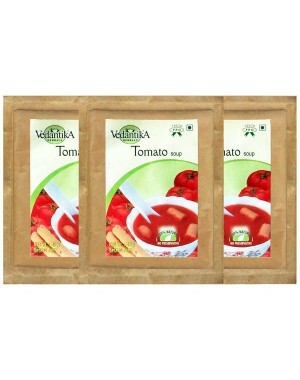 Vedantika Herbals Tomato Soup is a low calorie soup. The soup contains superior quality tomatoes, coriander leaves, ginger and garlic. The soup is high on nutrition value and is rich in vitamins, minerals and other nutrients. Tomato which contains antioxidants combats free radicals and protects the cells of the body from damages. The soup gives instant relief to the body when suffering from cough, cold and flu. Tomato is a good source of vitamin A, B and C, potassium and manganese. The soup replenishes the body with essential nutrients and vitamins. The soup is free of any artificial flavour or colour. The soup comes in convenient packaging and easy to use. Its low in fat content is ideal for weightwatchers.